Schedule may change so check https://bikenewton.org/services/bike-with-us/ before heading out. All Monday Evening Rides (except August 22) leave from the Newton Free Library on Homer Street. Please arrive 15 minutes early for travel instructions. All riders must wear bike helmets and have a bike in good working order. When riding after dark, bright front and rear bike light and reflective vest/shirt (night gear) are also required. 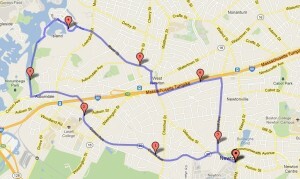 May 9, 6 pm Ride to Russo’s Distance: 5.6 miles Time w/stop: 1 hr Info: Short stop at Russo’s for shopping. 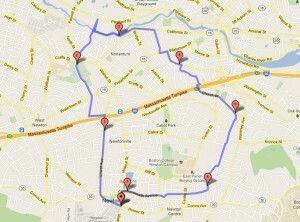 June 6, 7 pm Ride to a movie (West Newton Cinema) Distance 5.5 to 8 miles. Time w/Movie approx. 3 hrs Info: Some riding after dark. Bright front and rear bike light and reflective vest/shirt (night gear) required. Decide which movie we’d like to see, and depending on when that starts, decide how much riding we can do before the movie. After the movie, go directly back to the library. Bring money for the movie! June 27, 6 pm Ride to Auburndale Cove (longer version) Distance: 9.7 miles Time: 1.5 hrs Info: Night gear is required depending on return time. July 25, 6 pm Ride to Auburndale Cove (longer version) Distance: 9.7 miles Time: 1.5 hrs Info: Night gear is required depending on return time. August 22, 6 pm, Ride to Brighton/Charles River/Arsenal Mall, meet at the Star Market in Newtonville Distance 9 miles, time 1.4 hrs Info: Night gear is required depending on return time. May 15, 10 am Piano Bike Ride, ride to see all 9 Artful Pianos in Newton, stopping to listen to people playing along the way including anyone riding who wants to join in, meet in Newton Centre on the green (across from Panera). Join us en route if you would prefer. The approximate time for each stop can be found at: http://www.newtoncommunitypride.org/festival/music-moves-us.html Distance: 12 miles, given planned time to stop and listen along the way and a lunch break in Waban will return to Newton Centre at 2:15. Info: Bring snacks, water and lunch. We will have a 30 minute lunch break with planned performance on the lawn of the Waban Library. May 29, 10 am Bike for Dim Sum, ride to Chinatown, meet at the Star Market inNewtonville Distance 10 miles, Time: assuming return on 12:40 p.m. train, 3 hrs Info: Bike directly from Newtonville to Chinatown, arriving approx.11:15 a.m. Brunch on Dim Sum and leave in time to make 12:40 p.m. train from South Station to Newtonville (or West Newton or Auburndale). Bring money for train and lunch (about $20 total)! Bikers can optionally also bike back to Newton if they are up for it. 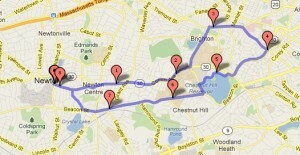 June 12, 10 am Bike for Brunch, longer ride to Ryles in Cambridge for Jazz Brunch. 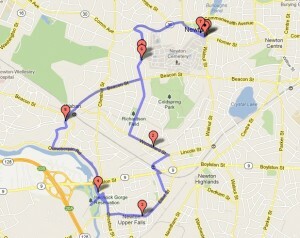 Meet at the Star Market in Newtonville Distance 14.2 miles roundtrip. Time, including Brunch, 3hrs Info: Bring money for brunch! August 28, 10 am Bike for a Picnic–longer ride to Drumlin Farm, Lincoln, meet at the Star Market in Newtonville Distance 17 miles Time, including picnic and possible Drumlin Farm visit, 4 hrs Info: Bring picnic lunch. Possible stop at Dairy Joy on the way back. Sept 25, 11 am Bike to a Sculpture Park. Meet at the Star Market in Newtonville Distance approximately 9 miles (round-trip) to Newton’s Kennard Park to visit the new Kennard Park Sculpture Trail. http://kennardsculpturetrail.org/ Meet at 11:00 am in front of the Star Market in Newtonville on Austin St. When return, Newtonville Village Day will be in full swing! http://www.newtoncommunitypride.org/newtonville-village-day.html Bike helmets are required & bring a bike lock so you can secure your bike and walk the Sculpture Trail. Like all Bike Newton Rides, this is a “No Rider Left Behind” Time: approximately 1.5 to 2 hours. We could always use some help. If you are an experienced rider, volunteer to lead or sweep! Questions? Email Nathan Aronow, Ride Coordinator, or call him at (617)-999-9924. Here is a sample of rides that we have designed and used over the last few years. If you have ideas for others, please email us! A group of bicyclists ready for a Monday ride at Newton Free Library. Hope to see you on one!